We are looking to appoint a second teaching assistant on an initial contract to 30th June, 2018 to work mainly with the kindergarten, but also with the primary and language classes when required. Duties will involve supporting and assisting pupils in the classroom as directed by the teacher concerned, supervising children at all other times in accordance with our policies governing discipline and welfare, and helping to maintain the school’s environment as befitting a place of learning. Hours will include Saturday mornings. 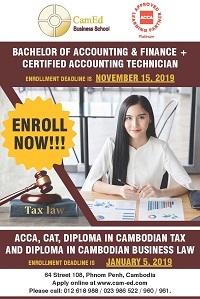 The successful candidate will have a university degree or similar qualification showing proficiency in both Khmer and English. Some ability in Chinese would be an advantage. Experience of working with children previously would be welcome but is not essential. Salary will be negotiable, but will be a minimum of $150 a month. A probationary period must be served.